You might want to skip this post if you aren’t hosted on WordPress.com. For WordPress Multiuser (like WordPress.com) they’re including links to other “related” posts by other people. Two of my blogging heroes and inspiration Jeff Atwood and Joel Spolsky have joined together on a new venture called StackOverflow: overflowing with awesomeness. They are also doing a weekly podcast, and you can download the first 45 minute podcast here (8 MB). In the discussion, Joel makes a great comment: Windows Vista gives you change without giving you any value. As a Windows XP user there is no compelling reason to upgrade because you’re going to have to relearn where everything is, but you don’t get any new and compelling features or applications to offset that. You know the story. You’ve been using LiveJournal since 1999. It’s your home. You’re familiar with it. You’re on the list of notable LiveJournal users. But times they be a changin’. You’re friends are all leaving LiveJournal for WordPress because it’s a better C-M-S (whatever that is). You’ve switched to WordPress, but everything looks strange and confusing. Don’t worry, as usual engtech has your back. Blogs have a way of keeping track of who is linking to them using trackbacks or pingbacks. It’s a good idea in theory because it helps you follow the discussion as it spreads to new areas, but in practice it is mostly filled with spam because getting a well-placed trackback on a popular website can be a good source of traffic. Trackbacks were designed without any kind of authentication mechanism whatsoever, not even the most trivial test that the person who is says they are linking to you really is linking to you. So screw spammy trackbacks. Screw them in their naughty place. Take them out of your blog themes and blog engines and let’s build something better. Here’s the idea: instead of showing a list of trackbacks for spammers to abuse, show a list of referrers. In Blogger GTD, Leo mentioned that it was a good idea to have one inbox for all your blogging related notifications. I hate cluttering in my inbox, but I do agree that it makes sense to have a single point of reference rather to spend 5 minutes checking some information in one place and then spend 5 minutes checking information in another place. As Skelliewag says, those 5 minutes add up over the course of a day and by the end of it you’ve wasted an hour. Directing everything to my inbox would never work for me, but it is possible to have a single start page for all your blog maintenance activities using Netvibes. If you aren’t familiar with Netvibes it is a combination of an RSS feed aggregator and a widget platform. It is analogous to iGoogle (but works better). In simple terms Netvibes lets you put lots of information in one place and look at information from several web pages on a single page. If you’ve never tried it out before then please visit http://netvibes.com — they let you play around with a default page even if you don’t have an account. This is what I put on my blog maintenance start page. 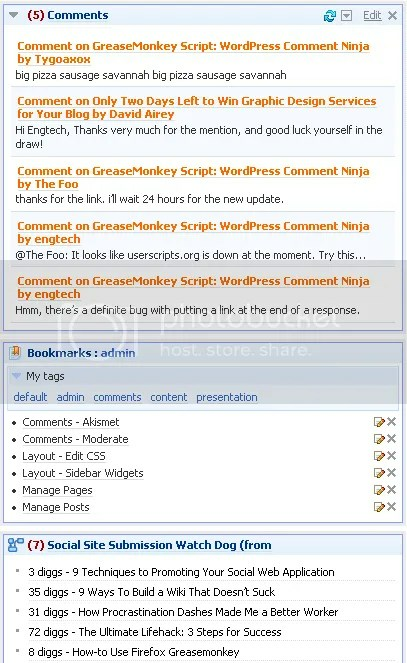 Replace internetducttape.com or engtech.wordpress.com with your blog URL. The first column is for things that I want to respond quickly to — comments and checking to see if my site is submitted to Digg or Reddit. Or you could use my WordPress Comment Extractor / WordPress Trackback Extractor to get only the comments or only the trackbacks. Box #2: Shortcuts to WordPress administration activities using the Netvibes Bookmarks widget. Box #3: Social Site Submission Watchdog is a custom Yahoo Pipe I created. It’s a bad idea to check your blog stats multiple times a day, but is it so bad if you’re also checking blog comments, emails and instant messages at the same time? Box #1: This will only work for WordPress.com bloggers, which is too bad because it’s a great way to check stats at a glance. Box #2: Technorati Rank from RSS. Another custom Yahoo Pipe. This one is a little more complicated to install because you’ll need your Technorati API key. Box #3: Filtered Blog Reactions from Technorati. This is another custom Yahoo Pipe. It shows the blog URL as the title and links to the front page instead of directly to the post. I use the second tab as a way to keep a quick check on how I stay in contact with other bloggers — through Gmail and Twitter. I use a dedicated Gmail account for blogging — I don’t receive any personal or work related email with that account. 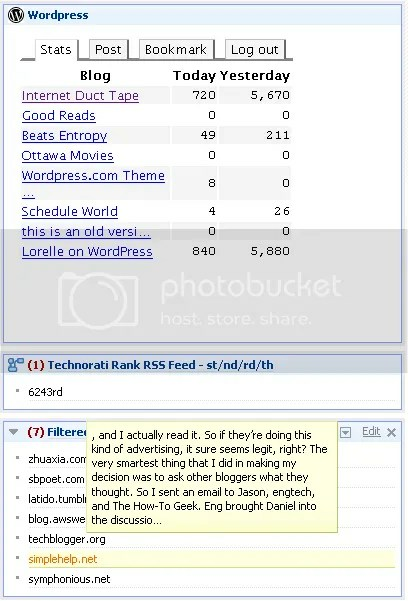 This shows some of the power of Netvibes — you can view password protected RSS feeds. This gives you a few ideas of how I use the service, but the possibilities are endless. Not to mention several widgets that let you directly embed a web page. Using those generic modules you can embed Google Reader into Netvibes and other crazy stuff like that. What are you going to put on your blog maintenance start page? Akismet Auntie Spam is a maintenance script for WordPress administrators. One of the problems with the Akismet spam protection service is that sometimes it misidentifies a real comment as spam. WordPress has a spam recovery console that I like to call the spam inbox. Have you ever stuck your hand as far back at you can into the crannies of your couch and pulled out what you found? That’s kind of what going into the default Akismet spam inbox is like. It’s a dark and evil place, filled with things that will make your eyes burn. You only wanted to find the quarter you lost, but before you know it your hand is stuck and something is touching you back. Akismet Auntie Spam is a kind old lady who will come to your house and give it a thorough cleaning. She’s not afraid of the dark corners, particularly the spam inbox because she knows exactly how to handle the creepy crawlies hiding out of sight. 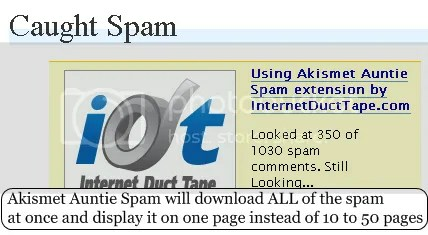 Akismet Auntie Spam is not a WordPress plugin. It is a script for the Firefox web browser that will work with any installation of WordPress or WordPress Multi-user — that means you can use it with WordPress.com, Edublogs.org, Blogsome.com and any site that is running WordPress with Akismet. Version 2 is a complete rewrite from scratch, and it is much less complicated now. There are no knobs and buttons for users to twiddle with — it works out of the box, the same way for everyone. Auntie Spam is here for one reason and that’s to save you time. Akismet Auntie Spam is in no way affiliated with WordPress or Auttomatic — it’s a script I created to make it a hell of a lot easier to watch out for false spam. Slight gotcha: if you are an old time user of Akismet Auntie Spam (from before August 2007) then you’ll want to uninstall your old version before installing the new version of the script. Find out how to uninstall a Greasemonkey script. What Does Akismet Auntie Spam Do? Much less time is spent navigating your spam inbox. You can see it all on one page, and it doesn’t take nearly as long to scroll through as it would without Akismet Auntie Spam installed. Fetches all of your spam comments and displays them on one page. Sorts spammers by the amount of spam they’ve sent. Shows only the first line of spam, so less time is spent scrolling. Automatically checks for a new version of itself every two weeks. Install it once into your Firefox browser and it will work with *ALL* your WordPress blogs. Go to your spam inbox on your WordPress dashboard console. Auntie Spam will immediately kick in and download all of the spam at once — no navigating between 10s to 100s of individual pages of spam. You can do something else like check your RSS feeds while she grabs all of your spammy comments and organizes them. Spam is sorted from newest to oldest and categorized from most spammy to least spammy. She groups spam by identifying the computer it came from, so surprisingly enough the more spam you have the easier it is to look through it all. She even summarizes it all by only showing the first line. Auntie Spam hates those idiots who keep sending you spam again and again. They can be completely ignored. As you read through all the comment summaries, you may come across one that looks like it isn’t spam. Click on the ‘# comments’ link and Auntie Spam will show you the full text of the comment and give you the option to mark it as not spam. Once all the spam is loaded there no need to reload it all because you want to search for something specific — hit Ctrl+F and use Firefox’s built in page search. When it comes to de-spamming marked comments, or deleting all comments, Auntie Spam gets out of the way and things work the same way they always have. If Auntie Spam is doing something you don’t want here to, you can return to way things have always been with a single click on the Greasemonkey icon and reloading the page. 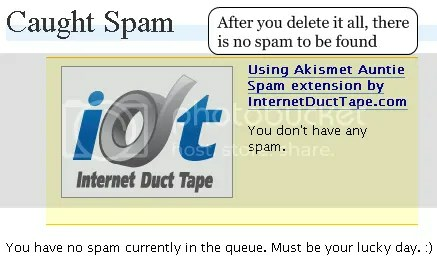 If you’re running WordPress and you’ve ever had to go dumpster diving for a comment that was accidentally marked as spam then you need Akismet Auntie Spam. I’ve created two useful diagrams for WordPress.com bloggers, and more importantly, for people who offer support in the WordPress.com help forums. One of my first and longstanding complaints of WordPress is that it does not understand the fundamental difference between tagging and categorizing. Categorizing is like taking all of your socks and putting them into drawers based on colours. Tagging is like sewing a little label on your socks that says when you bought them, how to wash them, and “if lost please return to the dude with the fat cat.” Categories add organization and tags add semantic information. 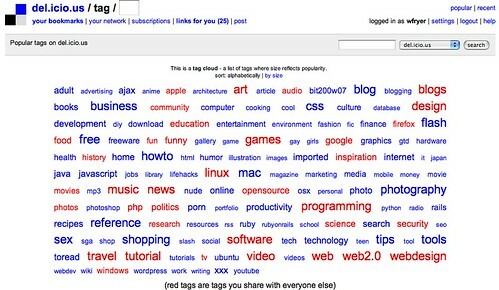 A category can be a tag, but if you use your tags as categories you’ll eventually have a right old mess. WordPress doesn’t (yet) let you easily differentiate between tags and categories without using extra plugins, which means those of us who are cohabiting in a WordPress Multi-user ghetto like WordPress.com are stuck with the plain vanilla categories and the ugly mess that most tag clouds turn into. I have more categories than posts on my blog because I use “WordPress categories” for both tagging and categories. And I’ve finally realized that makes it near to impossible for me to properly organize my posts and for other people to read my site and find things of interest. I’ve spent several days designing a blog that looks nice; it’s time for me follow through with the rest and climb out of the technical debt I’ve been incurring from my horrible overuse of categories and tags. Lorelle is the number one source of all things WordPress. She has written a *lot* about categories verses tags, and even went into detail about her experience in recategorizing everything. I find it absolutely amazing that she managed to re-categorize her WordPress.com blog in only a couple of hours. Categories in Action — How Do The Pros Do It? When in doubt find an expert and copy them mercilessly. Here’s the categories for some of the top blogs about blogging and my thoughts on them. My thoughts: Could be improved with hierarchy and grouping similar categories together. Blogging for Dollars, Adsense, Affiliate Programs, Chitika, Other Income Streams, Yahoo Publishing Network should all be under the same umbrella. My thoughts: I’d reduce a quarter of them from the list. Adding the “popular” category to track what people like is genius. My thoughts: There isn’t a lot of incentive to click on any of those titles. My thoughts: Only uses the letters B and W. :) Well thought out and descriptive. My thoughts: Firefox could be a subcategory of software. Not sure what Blogosphere, Blogroll or Strategy is about. Other than that it’s well done. My thoughts: Too many categories, maybe trim out some of the ones with less than double digits? She has a really impressive number of blog posts. My thoughts: Good use of long category names. I’m not sure how some of the categories are different. What Do The Pros Recommend? Daily Blogging Tips gives this advice on categories: be descriptive, limit the number to one screenful, try to put posts in only one category, and display the number of posts in categories. One of the best things I’ve seen about categories is the recommendation to go through your search terms and base your categories off of how people are looking for things on your blog. Identifying the blog posts with the most comments helps as well. Lorelle also includes the helpful advice to turn trackbacks off before you start reorganizing your categories or you’re going to spam the crap out of yourself as you resave all of your posts (whoops, forgot about that). Content before categories: You can’t know how what your categories are until you know what you’re writing about. If you have a new blog don’t worry about them until later. Categories are specific: Categories should tie together related content around a specific subject. The first time I reorganized my categories I tried to break everything down to “articles, opinions, blogging, links” but that doesn’t mean anything to anyone but me. Use long category names: Make sure the category adequately describes what it contains and has a title people WANT to click on. Use category descriptions: WordPress lets you put in some meta information about specific topics. Use it. You can even put links in these descriptions. Niche is king: It is much easier to organize categories on a niche blog. Niche blogs can have very specific categories because they are all related to the same main subject. If you write about a multitude of subjects, then you need to have general categories with more specific categories underneath them. Less is more: The more options you give a reader the less likely they are to interact with any of them. Too many categories/tags means I’m not inclined to click on any of them. Don’t have a lot of categories and don’t assign posts to too many categories so that readers feel like they’re always seeing the same posts in different categories. Think maintenance: Time spent managing categories and tagging is time spent not writing posts or *gasp* doing something else. Too many categories makes it hard to pick a category for a new post. Plan it: write down your planned list of categories before you start reorganizing and do a walk through your archive to see if they match. Categorize your flagship content: Blogs always end up with a lot of “meh” or “look at this” type of posts. What you want to do with your categories is focus on the articles that add value to the reader. If you have posts that should be swept under the rug, then don’t bother categorizing them, or put them under something like Misc, Asides or Links. Rule of 10: If a category isn’t going to have at least 10 posts, then it shouldn’t be a category of its own. Use excerpts: Your category/archive pages should show excerpts instead of the full content. The excerpts should be long enough to entice the reader. Screw tagging: This took me forever to realize, but tagging isn’t usually worth the time and effort. Tagging only works well when more than one person is tagging content. If it’s just one person doing it then it turns into a mess every time… a big cloud of nothing. Tags are useless for helping people find things if each tag only has one post. Tagging with WordPress makes categories unmanageable and unorganized. A well directed Google Custom Search engine can replace the need for tags. The solution I came up with tags is to have some direct sub-categories under my main categories. These are the steps I took to drastically reduce the number of categories I had on my blog. Use the WordPress Category Resizer to make the category editor in the edit post window bigger. There’s a reason why I only do this every nine months or so. Still too many categories, but much better than before. Obviously I didn’t follow a lot of my own advice. There are still some categories that could get nuked, but I’m using them as tags. The users will be presented with the following categories in the sidebar as a text widget. All of the subcategories are used as tags. In case you missed the last post, there is a CSS design contest using the Sandbox theme for WordPress. That post will explain what the heck it is all about. I’ll be the first to admit that I only know the tip of the iceberg when it comes to CSS design, but one ‘workhack’ that easily applies to any kind of programming activity is rapid development. The concept is simple: reduce the time between action and result to the shortest amount of time possible so you can get more done. My number one tip for doing a fast CSS design is to do it all on your own machine instead of doing it live on the Internet (or wordpress.com). It will save you lots of time and headaches. I’ve taken the sample blog and example CSS template provided by Scott Wallick and made a very easy to use downloadable archive. It contains nothing but the HTML files, image files and CSS from the sample blog. It can get you redesigning Sandbox in less than a minute. I find it easier to work on HTML files saved on my computer than creating a dummy blog on a fresh WordPress installation. If you feel the same way then downloading this archive is right for you. I heartily recommend the combination of the Firefox web browser with the Firebug extension. The learning curve for Firebug is a bit steep, but it will save you a lot of time in the long run because it is chock full of goodies as can be seen on this page. One of the hardest things I find in web design is getting something to look the same in multiple browsers. Having multiple browsers on hand to check out your changes locally is a must if cross-browser compatibility is important to you. Here are the top browsers to consider. Market share numbers are from w3counter (thanks Daniel). The market share should give you an idea of which browsers to spend the most time designing in. I find Firefox the easiest to work with. Jalaj gives a few other suggestions. One highly recommended technique is “reseting” CSS properties at the beginning of the file to remove slight differences between browsers. It is important to test your design in different screen resolutions. Market share numbers are from w3counter. Something else to keep in mind is that those big old CRT monitors and those funky new LCD monitors display colours differently. I recommend the Window Resizer extension for Firefox for rapidly switching resolutions. Firebug may be able to do it as well, I am by no means an expert. There’s a lot out there to learn about CSS design, here are some highly recommended links with more information. If you have any other suggestions, drop them in the comments. GIF, JPG, PNG? What image format should I use? Web pages (ie: what you are looking at right now) are composed of many things. If you think of web pages as a house, HTML is the foundation and structure while CSS is the aluminum siding, brickwork and paint. HTML stands for Hypertext Markup Language and CSS stands for Cascading Style Sheets. A passing knowledge of both of them is essential if you want to run your own website. The whole idea behind HTML and CSS is that you use HTML to format your web page (or blog post) with things like headers, bold, lists and tables. 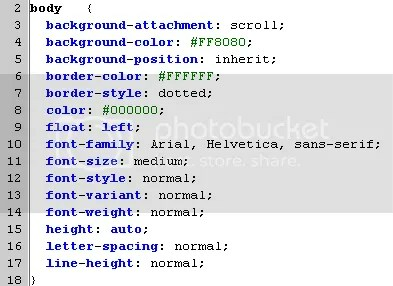 Then you use CSS to style those elements so that they look the way you want them to. The whole idea behind it all is that you can build the structure with HTML once, and then change the look of it whenever you want to using CSS. If you want to change the way your WordPress blog looks there are two ways to do it. The first way is to change your theme. 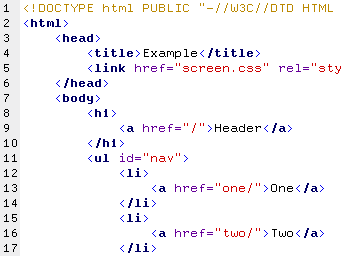 This changes the underlying HTML formating structure. The second way is to leave the theme alone and change your CSS. If you are running a blog hosted on WordPress.com, then the only way to customize your theme is to buy the CSS editing upgrade, choose a base theme, and then use CSS to redesign it. The preferred WordPress theme for CSS designing is Sandbox because it gives you so many things to play with. Internet Duct Tape is hosted on WordPress.com using the Sandbox theme and a custom CSS design by yours truly. If I can find the time, I will be participating in the contest. The creator of Sandbox is running a theme design competition with monetary prizes. The pot is getting pretty big right now, and the top six designs can win between $50 to $750 US. Even if you’ve never tried your hand at designing CSS before, this is the perfect time to give it a shot. Scott has put together sample blog content for designing CSS for Sandbox and he also has a template file with all of the Sandbox CSS selectors. Got a freely available Sandbox design? Leave a comment with a link! Click here to view a random post from //engtech. Thanks to Matt and the suggestion from TechCrunch it is now possible to surf through any wordpress.com blog at random. If you look at my sidebar there is a new link called “Random Post“. Keep clicking it to go to any other post I’ve written at random. You might be surprised at what you find! All wordpress.com bloggers can do the same thing for their blog by adding “?random” to the URL of their main site. This post is by a guest blogger. Daria Black is a freelance writer and web designer. Visit her website Webernet Architect located at for information and tutorials on web design, blogging, social networking and a general guide to having fun on the internet. To learn more about Daria visit her personal weblog at Lexicon Indigo. When I first heard of WordPress widgets, I was appropriately disgruntled. ‘Widgets? We don’t need no stinking Widgets,’ I grumbled. I was resistant towards the notion of widgetizing my themes because it meant having to change my style of design from using divs to separate the content in my sidebar to placing everything in an unordered list. But when I saw how they make the end user’s life a little bit easier and how they can make an already powerful content management system even better, I can’t praise the creators of the Widgets plugin enough. So to show you just how creative one can be with the plugin, I’m going to share with you a way to create a template where you can have different widgets on each of your template’s page views; the index, single post and Pages. This tutorial assumes you have a basic understanding of WordPress themes and prefers that you know a little bit about PHP as well. However, knowing how to follow directions and cut and paste is just as good. Sulz is 21 year old Chinese Malaysian college student. She blogs at her whim and fancy, which is almost every day, but mostly about her life and what issues that provoke her thoughts. Blogging is her only cathartic outlet for expression. Devours books like food and devours food like a non-eating-disorder person. You can read more of her writing at Bloggerdygook. As a volunteer providing free support for WordPress.com in the Support Forums, every now and then it’s hard not to get frustrated with the new users who ask questions without taking the time to read or search the FAQ and past forum threads. On the other hand, you can understand somewhat the feeling of being overwhelmed by the mountain of information in past threads or the FAQ that it totally turns one off from searching for an answer. Posting elementary support questions in the forums is an easy way to get an answer. But is it the best way? Ask nicely and you shall receive. I’ve created a program that let’s you create tag clouds on WordPress.com blogs. I said I was going to do this a long time ago, but there was approximately another 30 hours of work to bring the program from the level where I could use to the level where someone else could install and use it. I first heard of Splashcast when TechCrunch uber-editor Marshall Kirkpatrick left to join them. Today they’re finally opening for business. SplashCast enables anyone to create streaming media ‘channels’ that combine video, music, photos, narration, text and RSS feeds. These user-generated channels can be played and easily syndicated on any web site, blog, or social network page. When channel owners modify their channel, their content is automatically updated across all the web pages ‘tuned’ to that channel. Splashcast lets you create embedded multimedia that you can stick on any webpage that support embedding flash videos. It offers direct integration with Flickr and Youtube. Other people can subscribe to your splashcast and you can host this single splashcast on multiple sites. What came as a pleasant surprise was seeing that they’ve been working behind the scenes with the guys at WordPress.com — so if you’re running a WordPress.com blog then you already have the ability to use it. But why would I want to use this? My first attempt at splashcasting is the latter. How would you use Splashcast? It was very easy to create. The only issue I ran into is how do I post it on my WordPress.com blog? WordPress adds additional mark-up to make it easier to embed supported flash players, but for all that Splashcast was suggesting I host a free blog on WordPress.com, they didn’t provide me WordPress.com specific code for embedding the player. The important part in that text is the player_code. …but without the spaces in front of splashcast. It would be nice if they gave a unique URL for the splashcast the way Youtube does. Those are really handy for linking in RSS, bookmarking and sending by email. I wouldn’t be surprised if they already do, but it wasn’t immediately obvious. Too many pop-ups — every modern browser has a pop-up blocker and this creates a headache. At the very least have an intro in the beginning asking people to allow pop-ups for the site and showing them how to. Why is there no option to automatically repeat the splashcast? Since autoplay is an option, you’d think you could repeat to have an automatic slideshow. When adding photos, I could not associate a link with them. When adding text, there was no option to add thumbnail images as well. Justification is for the entire text page, not the selected text only. Manipulating text size/colour/background colour is error prone and did not always save properly. Adding unwanted whitespace in the text. Even though the text fit on the screen when editing, it ran off the screen when using scrollbars. I’m not sure if Splashcast is still in beta or not, but you can try signing up for an account here. In the future you’ll probably be seeing a Splashcast permanently in the bottom bar of my blog showing off my best posts. WordPress 2.0.7 was released yesterday. Click here for details of the fixed vulnerabilities. Unfortunately, that was not soon enough for several web masters who run SEO sites. A hacker going by the name of FuckingPirate has taken down three popular SEO sites so far and published a hit list with more. I was one of the people who was a little disappointed that WordPress.com supports Snap Preview Anywhere but not MyBlogLog. If you look at adoption of the Snap Preview Anywhere widget it was disabled by most major blogs after just a short trial because users hate it (problogger, johnchow, lorelle, digital inspiration, a VC, instigator, ). NOTE: Readers can disable Snap Preview Anywhere on *ALL* blogs they read by clicking this link. You will have to do it on all your web browsers because it is a cookie setting. The response to MyBlogLog however was very different. People love it because it’s a way for readers to promote their blogs, and for bloggers to find out who their readers are. After MyBlogLog was acquired by Yahoo I was hoping they’d get an official sidebar plug-in. I was surprised to find out that I was the first WordPress.com user to ask for it. In order for that code to work you will have to change UNIQUEID to your MyBlogLog ID and YOUR_COMMUNITY_NAME to your MyBlogLog user name. Do not cut-and-paste this code into your text widget, go to MyBlogLog.com and get the specific code for your site from them. They also give you optional CSS code (you will need the CSS upgrade to use — CSS is not required for the upgrade to work). Here’s the gotcha though: they only give you the code if your blog domain name ends in WordPress.com. So if you are running a WordPress.com blog with a custom domain name you’ll have to change your MyBlogLog setting to your WordPress.com domain name temporarily in order to get the widget code. Leave a comment if you are having trouble. I don’t know about you but my Akismet spam folder on my WordPress.com is filled to the brim (56 pages deep, which is ridiculous if you consider that anything older than 15 days is automatically deleted). It’s considered good form to take a peek to make sure that no one’s comments are being accidently deleted, but the sheer volume of spam makes that hard to do. So I wrote a Greasemonkey script for Firefox that greatly condensed the view. With this script I can view 16 to 18 spam comments per page compared to 3 to 5 spam comments per page without it. Moves navigation bar to the bottom instead of the top. Click to open a popup with full comment. With Akismet Auntie Spam you can go from 3-6 comments per screen of text to 17-20 comments per screen of text. Read more information and find out how to install it here. This is installment #5 of the WordPress theme review. My goal is to provide a clear document of the themes for the WordPress.com community. I also want to report all theme bugs to improve the experience of WordPress.com community. Support this project by linking to https://engtech.wordpress.com/tools/wordpress/wordpress-theme-reviews/ on your WordPress.com blog. The themes released in October 2006 for WordPress.com have some features in common: they’re all fixed width and none of them display the author name (so not good for multi-author blogs). Chaotic Soul is a very well-done theme. There’s only one bug I could find with it, and that is more a stylistic choice than anything else (search box gives no indication that it is a search box). Categories aren’t displayed on the main page, and that could be considered a Pro. The only issue I have with it is that it’s a dark theme and there isn’t very much whitespace between text — this makes it hard to read for people with visual disabilities. I’d love to see a version of this with a white background, larger font, more whitespace between text, and a distinct colour choice between the text body and the link colour. That is my personal preference though. If you like dark themes then Chaotic Soul is easily the best WP.COM has to offer at the moment. I was very excited about Tarski until I noticed one glaring problem: WHERE ARE THE COMMENTS? Seriously, I couldn’t find a single comment on any post/page on my sample blog. The example blog by the theme author shows comments, so I’m not entirely sure what is going on. CONs: Headers look the same, missing next/prev posts, no comments allowed? Unsleepable has very distinct links with high contrast from the text on posts. I am always surprised more theme designers don’t do this. What is the point in having linked text if people can’t see it? Conversely, I really hate how links blend directly into text in the sidebar. It’s a great theme except for the funky bug with right aligned/left aligned images. K2-Lite is a good theme except I really hate the way the navbar looks, but other than that this is a good theme. The only glaring bug is that if you use heading1 anywhere in your posts it will not display. This won’t be a problem for most people. The pick for best theme out of this round is much harder. They’re all very good (definite improvement in theme selection), but I’m going to have to give it to Chaotic Soul because it is the only one without any bugs (other than issues some readers might have with font size/contrast). After the break, the huge table that compares the theme features and lists their bugs (which is really the meat of this review). 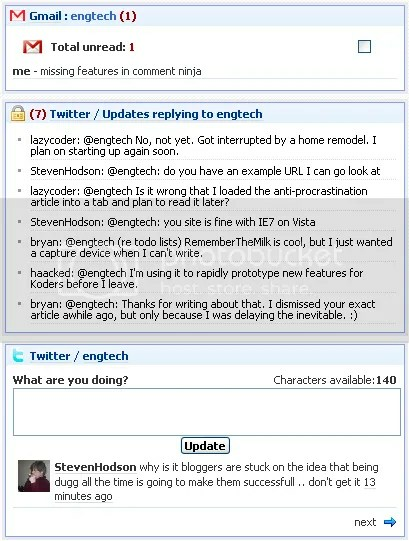 Subscribe to engtech’s WordPress.com Theme Review series for automatic updates. Updated weekly. Regular readers may already have realized that I’m a WordPress.com fan boy. Anyone who has come from Blogspot will tell you how good things are over here (not that there isn’t the occasional problem — I’m the reason the Delete Post button turns red when you hover over it). I don’t post about every new feature that hits wordpress.com, but I thought people might be interested in finding out more about the latest paid upgrade from the point of view of someone who’s using it. 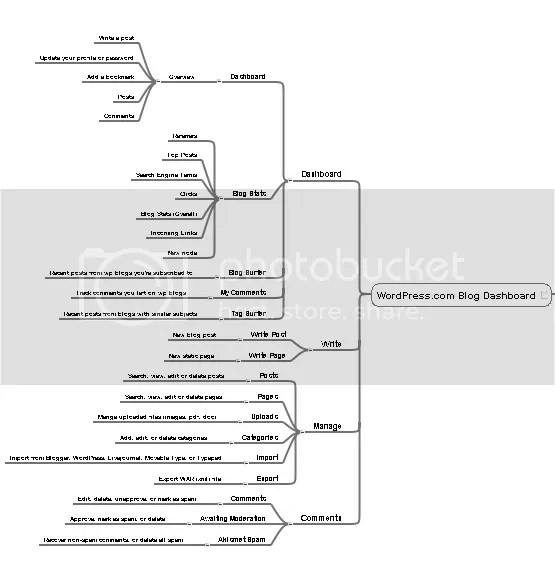 WordPress.com introduced Domain Registration and Mapping this week (Raincoaster got the first one). The price is reasonable at $10 USD/year for domain mapping or $15 USD/year for domain mapping and registration — and it fits in with their business model of world-class hosting for free with premium upgrades for power users. Some friends and I had been talking about getting beatsentropy.com for several months and our laziness paid off with a much simpler solution.